Awkward. On 60 minutes, Ryan talks eliminating tax shelter loopholes as Romney tries not to look horrified. Fairness dictates that the highest-income people should pay the greatest share of taxes, and they do. And the committment that I’ve made is we will not have the top income earners in this country pay a smaller share of the tax burden. The highest-income people will continue to pay the largest share of the tax burden, and middle income payers under my plan get a break. Their taxes come down. So we’re not going to reduce taxes for high income people and we are going to reduce taxes for middle income people. 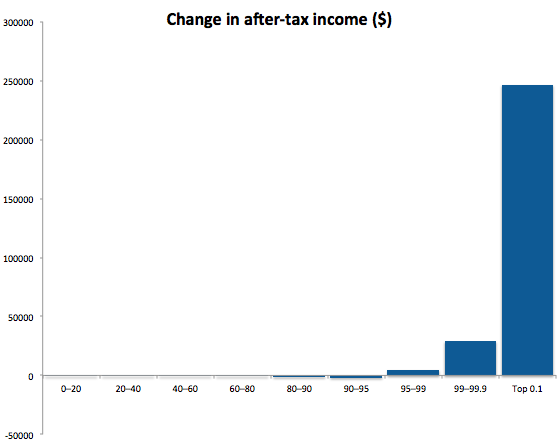 There’s a nugget of truth in Romney’s claim that high-income earners won’t pay a smaller share of taxes. He has not proposed replacing the progressive income tax with a flat tax (say, 20 percent for everyone), nor has he proposed giving the highest-income people a lower income tax rate than middle-class people. Under Romney’s plan, many rich people will still pay a higher percentage of their income in taxes than poorer Americans will. Those changes are on top of current policy, which includes the Bush tax cuts. (Ryan’s budget, as I noted earlier, would likewise raise taxes on the lowest earners while disproportionately boosting the uber-rich and cutting Romney’s personal tax rate to just 1 percent of his income by phasing out capital gains and dividend taxes.) If Romney’s new message is that he’s still going to make top earners pay their share, it might be his most audacious spin yet.